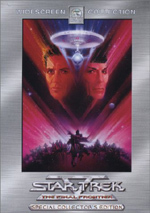 Star Trek V: The Final Frontier appears in an aspect ratio of approximately 2.35:1 on this single-sided, double-layered DVD; the image has been enhanced for 16X9 televisions. Overall, the transfer looked very good, and it narrowly fell short of “A”-level standards. The main problem with the picture related to print flaws. While these never became dominant, they popped up moderately frequently during the movie. I saw occasional examples of specks, grit, and other instances of light debris. Although these weren’t heavy, they presented some distractions. Otherwise, the image looked excellent. Sharpness came across wonderfully. The movie always appeared nicely detailed and well developed. Even the widest shots remained crisp and distinct, and I noticed no issues connected to softness. There were also no signs of jagged edges or moiré effects, and I witnessed no examples of edge enhancement. Colors seemed tight and rich. The various settings offered a nicely broad palette that the DVD presented accurately and firmly. Even instances of red lighting – which often cause havoc on TV screens – appeared distinct and concise. Black levels were deep and firm, and low-light shots displayed solid clarity. For example, nighttime exteriors showed nice delineation of all the elements despite the darkness of the setting. Ultimately, I felt very pleased with this transfer, and only the smattering of source defects knocked my grade down to a “B+”. How did this image compare to that of the original DVD? This special edition presented a brand new anamorphic transfer, whereas the old non-anamorphic one apparently came from the same source as the film’s 1991 laserdisc release. The new transfer looked slightly cleaner, and it also demonstrated improved detail and sharpness. It also lost the light edge enhancement from its predecessor. While the new DVD offered a fresh and superior transfer, the Dolby Digital 5.1 soundtrack on both discs seemed identical. That was fine with me, as the audio worked quite well and barely showed its age. The front soundstage was especially wide and broad. The mix featured a nicely spaced array of effects and also often - though inconsistently - tossed dialogue into the side channels. The surround track didn't appear to offer any split channel usage but it added a nice dimensionality to the experience. Elements zipped around the spectrum accurately, and the mix seemed nicely active and involving throughout the film. 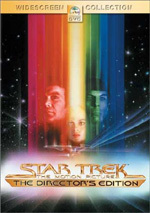 The collection of supplements packaged with this special edition of Star Trek V opens on DVD One with an audio commentary from actor/director William Shatner and his daughter Liz, the author of “Captain’s Log: William Shatner’s Personal Account of the Making of Star Trek V: The Final Frontier”. Both sit together for this running, screen-specific track. 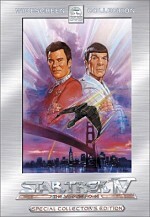 DVD One also includes a text commentary written by Michael and Denise Okuda, the authors of the Star Trek Encyclopedia. While prior text tracks for the Trek films were quite stimulating, this one seems much more average. It heavily emphasizes nuts and bolts elements of the production. We get scads of information about special effects and visual trickery; at one point, I feared that the Okudas would never stop writing about the damned rear projection starfields in use. Some additional notes about the participants and connections to other Trek material appear as well, and we get a couple of wry jabs at goofs and stretches of reality found in the film. Surprisingly, the commentary steers totally clear of any controversies that affected the production and we get no sense of its troubled nature. Some fun information appears here, but the text commentary seems best suited for Trek diehards and comes as the weakest of the five to date. On DVD Two, we find extras divided into five different areas. Inside The Star Trek Universe we locate five elements. We open with a featurette called Herman Zimmerman: A Tribute. This 19-minute and eight-second piece looks at the Trek production designer. We hear from Zimmerman, project coordinator and archivist Penny Juday, producer/co-writer Harve Bennett, concept artist John Eaves, and scenic artist supervisor Michael Okuda. A few decent notes about Zimmerman’s life and work emerge, but the program suffers from a heavily puffy tone. It mostly tells us how wonderful Zimmerman is but doesn’t give us enough examples of why he’s wonderful or how he does his job. A Green Future? ends “The Star Trek Universe”. The nine-minute and 24-second featurette gives us remarks from screenwriter Loughery, production designer Zimmerman, UCLA Institute of the Environment Director Richard P. Turco, astrophysicist/author Brin, Yosemite National Park Outreach Specialist David Siegenthaler, producer/co-writer Bennett, and Yosemite Cultural Interpreter Julia Parker. This offers little more than a warning that we need to make sure we don’t ruin the environment. It seems preachy and dull. Next we shift to Production and its six components. Harve Bennett’s Pitch lasts 102 seconds and offers a bizarre pep talk of sorts. The producer directs his message toward the sales force who were to promote Frontier, and he uses the Vulcan salute to make his point. Given Frontier’s commercial and critical failure, I figure he never did that again. The DVD’s longest program, The Journey runs 28 minutes and 53 seconds as it covers the production of Frontier in general. Shatner, Bennett, Leonard Nimoy, executive producer Winter, screenwriter Loughery, production designer Zimmerman, cinematographer Andrew Lazslo, scenic artist supervisor Okuda, concept artist Eaves, and science advisor Dr. Charles Beichman. 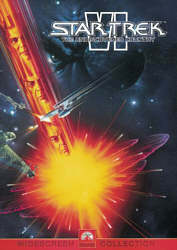 They cover the story’s genesis and development, location and effects issues, alterations to the ending, and the film’s reception. This program is a little more frank than usual, especially when Shatner acknowledges his lack of assertiveness as the director. It doesn’t delve into any of the subjects with much depth, though, and it totally refuses to acknowledge the film’s financial failure; Shatner claims that in the end, all the Trek flicks made about the same amount of money, which is way off base. “Journey” has some good moments, but it falls short of becoming a really strong documentary. After this we find nine minutes and 49 seconds of Make-Up Tests. We get shots of “God”, Sybok, General Korrd, Caithlin Dar, and various aliens. Nothing in this silent footage seems terribly fascinating, but it’s a decent piece of history to include here. A similar piece focuses on Pre-Visualization Models. This lasts 101 seconds and shows crude representations of shots that would involve effects. These low-tech planning tapes are always fun, and this one’s no exception. Lastly, “Production” ends with the Star Trek V Press Conference. Another piece of archival material from 1988, this 13-minute and 42-second session comes with an introduction from Ralph Winter. Filmed on the last day of principal photography, it includes comments from Harve Bennett, Winter, Shatner, and actors George Takei, Nichelle Nichols, Walter Koenig, James Doohan, DeForest Kelley, and Nimoy. Not surprisingly, this is a fluffy little affair with no real substance. Except for actors, the actors show up just for the publicity; they appear on the set of the Enterprise’s bridge and then promptly split. Shatner fields some softball questions and deflects anything related to the nature of the story. Though lacking in substance, I must admit it’s fun to see this as a historical curiosity. As we move to the Archives, we get two sections. The Production Gallery offers a four-minute and four-second compilation of photos. These seem above average and include some good snaps. Storyboards covers three different movie scenes. Each segment includes between 54 and 82 frames for a total of 197 storyboards. Though split into three areas, they cover the entire ending sequence set on Shakari. They’re mildly interesting but not revelatory. Of great interest to fans will be the collection of four Deleted Scenes. We find four of them, and they run a total of four minutes, 17 seconds. Don’t expect any lost gold, though. One is just dull, and the other three are openly embarrassing. One complaint: the “Klingon Couple” featurette displays a short look at a cut sequence between Klaa and Vixis – why isn’t it here? The Advertising area ends the set with two trailers and seven TV spots. Badly maligned it may be, I still like Star Trek V: The Final Frontier. I’ll gladly acknowledge its many flaws, but I think its foes too quickly dismiss its positives. It remains possibly the most introspective and deepest of the Trek flicks, and that tone makes it interesting. This new special edition provides very positive picture and sound. The extras remain a bit more superficial than I’d like, as they don’t delve much into the film’s problems. Nonetheless, they cover the production reasonably well. As a reissue, this new Frontier is a success. It improves upon the prior DVD’s picture and extras; the audio remains the same, but since the old disc already sounded great, that wasn’t a problem. I definitely think fans who own the prior release will want to upgrade to this new one; even those who don’t care about supplements will benefit from the improved picture quality. I also would urge Trek partisans who don’t have the earlier disc to get this one. Give Frontier a shot, watch it with an open mind, and maybe you’ll actually like it.